Okay, this is not a toy. It is a toy accessory. 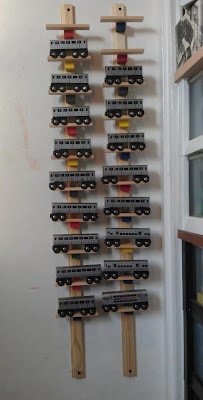 Today my husband decided on a whim to buy some wood to build Number 2 a train display rack. It is not wholly sturdy as in the trains could fall off if there is someone bouncing around BUT, that said, it could encourage at least Number 2 to step lightly in that section of our home. He showed both Number 1 and Number 2 just how simple it can be to make something really awesome out of very ordinary things. Another plus is that I am really running out of space here. We are actually using a door and not a wall for this display rack. We barely have wall space since it is almost always graced by artwork from school. But since it is on the door, that means they must ALWAYS close the door quietly! Oh... I don't know if they can do this, but they better... or else the rack comes down. Lastly, Number 2, who is pretty much freakishly neat anyway, will now have an opportunity to model to his older brother just how nice it is to be freakishly neat. I will give him a little duster from the dollar store since now his trains will get covered with dust when it is not being used. Wait, he plays with those everyday? There should be no dust! Forget the duster! Less is more. Happy Holidays to all! Next post coming soon! Disclosure statement: Toys are Tools has not been compensated in any fashion by the manufacturer or retailer of any of the mentioned products for the publication of this post. However, the editor is married to the maker of this product who prefers to remain anonymous.